John Joseph Wamwara, an SJD candidate in law and religion, is the Center for the Study of Law and Religion's first Dooyeweerd Fellow in Law and Religion. Named for Dutch philosopher Hermann Dooyeweerd, the award recognizes a student who has exceptional scholarly potential and provides the student with a Scholarship Advancement Fund to be used in building the student's scholarly portfolio. Wamwara's research interests are in religious extremism and the right to freedom of religion; marriage, religion, and the law; international humanitarian law; and human rights. He is currently a research assistant to John Witte, Jr. and has worked as a research assistant to Martha Fineman. "I am alive to the responsibility accompanying this award," Wamwara said. "I commit to nurturing the potential you have seen in granting this award, hoping that it will blossom into a life that enriches humanity." 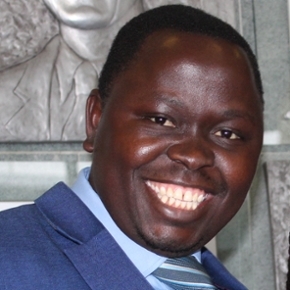 Wamwara is an Advocate of the High Court of Kenya; Public Law Lecturer at Moi University and at Catholic University of Eastern Africa Schools of Law. He has worked as a Legal Officer at the International Committee of the Red Cross, the Kenya National Commission on Human Rights, and the Kenyan Parliament. Wamwara holds an LLM in Law and Religion from Emory University; an advanced LLM in International Humanitarian Law and Human Rights from the Geneva Academy of International Humanitarian Law and Human Rights (Joint Centre of University of Geneva and Graduate Institute of International and Development Studies); a Post-Graduate Diploma in Law from Kenya School of Law; a Bachelor of Laws from the University of Nairobi; and a Certificate in International Criminal Law from the International Law Institute – African Centre for Legal Excellence.